As a mathematics teacher, how do you respond? As a language teacher? As both? Farida’s words can be interpreted in several ways. She seems to understand the features of common polygons and be familiar with their names, but the names themselves are a little mixed up. When she says that pentagons have eight sides, it is not clear whether she is thinking about octagons or has not learned the correct definition of pentagon. Is the issue here one of language or of mathematics? Or both? This brief situation highlights some of the challenges of learning and teaching mathematics through a second language (L2). It should not be assumed that learning mathematics through an L2 is necessarily detrimental to students’ success. Evidence from immersion programs suggests that students can achieve similar scores in mathematics as students enrolled in regular English programs (Lapkin, Hart & Turnbull, 2003; Swain & Lapkin, 2005; Turnbull, Lapkin & Hart, 2001). In some cases, students in immersion programs outperform students in regular English programs in mathematics (e.g., Bournot-Trites & Reeder, 2001). However, other cases have been documented in which partial immersion students underperform (de Courcey & Burston; 2000). There has, however, been little research on the process of learning mathematics within immersion contexts. More generally, research on content classrooms in immersion programs tends to focus more on language learning in the context of content (e.g., Lyster, 2007). Such work rarely engages with research in content area learning and teaching, such as from the domain of mathematics education. Nevertheless, teaching mathematics in a language that students are learning is challenging. In particular, it is difficult to maintain a dual focus on both language learning and mathematics learning. As a mathematics educator with expertise in L2 education, I am interested in how mathematics learning links with language learning. mathematics classrooms in many parts of the world where English has been adopted as the language of schooling, even though most of the students do not speak English much at home, such as might be found in South Asia or southern Africa. Despite the diverse second language settings in which mathematics is taught and learned, it is striking how certain issues consistently arise. I describe these issues as tensions, since they are often present for teachers or learners, but cannot necessarily be resolved in a simple way. Of course it is important not to assume that research conducted in any of the above settings applies directly to immersion contexts. These tensions, however, are present in a variety of L2 settings and seem to have a degree of generality that may be productive for immersion teachers to consider. Five tensions are described below, but let us first look at an illustration from Halai (2009). She recorded the following discussion in Pakistan where she lives and works. Although Urdu is the national language of Pakistan and most people speak at least one other regional language, mathematics is taught in English. A group of three 10- and 11-year old students are working on the following word problem: Sara will be 28 years old after 9 years. Find her present age. This exchange in a L2 mathematics classroom illustrates the following tensions inherent in teaching mathematics through a second language. Perhaps it is not surprising that there should be a tension between teaching and learning language and teaching and learning mathematics, particularly for teachers. In Halai’s example, students are discussing the language of the question. For me, this is not a case of ‘first understand the question, then do the mathematics’; rather, sorting out the language of the question also entails sorting out the mathematics. In this case, then, attention to language is relevant and contributes to mathematical thinking and understanding. Such attention may not always be productive, however. On some occasions, attention to language may impede mathematical thinking, particularly if the linguistic feature in question is not mathematically significant (Adler, 2001; Halai, 2009). Mathematics teaching and language teaching intersect in the implicit or explicit teaching of formal mathematical language. Requiring students to use rigorously formal mathematical language may inhibit their ability to express their mathematical ideas, and so have a negative effect on their learning. On the other hand, an acceptance of overly informal language does not promote the development of suitably mathematical language. In the example shown above, for instance, it strikes me that the students do not use words like ‘add’ or ‘subtract’. In the classroom in Halai’s research, students were expected to speak English in public, although they could seek the teacher’s permission to speak Urdu. The mixture of Urdu and English evident in their group discussion shows how they drew on both languages in their work. Research in bilingual education highlights how language minority learners use their first languages productively to learn a second language (e.g., Cummins, 2000). 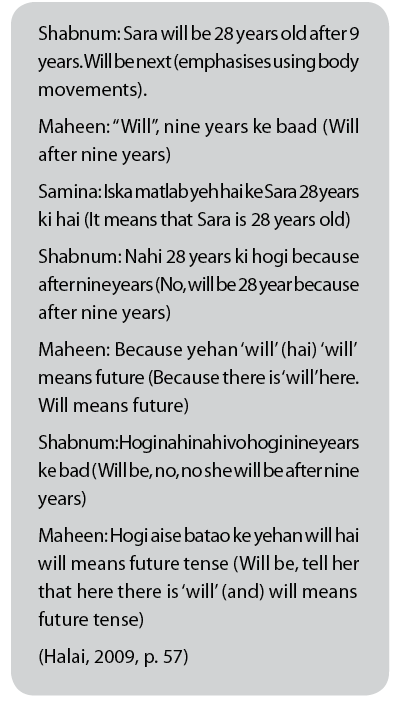 In the above example, the discussion about ‘will’ seems to be linguistically rich and is likely to contribute to the students’ learning of English, within the context of mathematical thinking. The tension cannot be eliminated, however. Too much use of students’ first languages would negate the idea of learning the target language. Although there is little research about the use of L1 in one-way and two-way immersion contexts, the idea does have its advocates (e.g. Cummins, 1998). Such an approach would, however, need to consider carefully how L1 use impacts L2 production and acquisition in the distinctive contexts of immersion programs. More research is needed. Language education must be understood within its wider social context. In many situations, the language of schooling is dictated by social or political factors, rather than educational concerns. In Pakistan, there is parental pressure, particularly from upper socioeconomic groups, for instruction in English. The perceived value of English as necessary to get into good universities or join the civil service is in tension with the value of learning mathematics in a familiar language. Education must also be understood within its policy context. The language of schooling is often set by national or regional policy, rather than by parents or teachers. In Pakistan, the government has recently introduced English as the medium of instruction for mathematics, despite a lack of English-speaking teachers. As the extract shown above illustrates, what is required by policy and what happens in classrooms may not be easily reconciled and can often be in tension. Teachers and students will, at some level, use whatever means they can to ensure learning and understanding. As mentioned, these tensions are not necessarily resolvable; they are ever-present. Sometimes, however, it is helpful to identify such tensions, so that we can work more explicitly to find ways to deal with them. In Mathematics in Multilingual Classrooms: Global Perspectives (Barwell, 2009), the contributors describe mathematics classrooms in L2 learning settings in the U.S., England, Wales, Australia, Pakistan, and Malta, illustrate how these tensions arise, and highlight the different ways they can be addressed. It seems reasonable to assume that similar issues arise in immersion mathematics classrooms. Indeed in a rare study, Burston (1999) examines how French immersion students in Australia use both French and English while solving a series of mathematical word problems. Her study reveals a variety of strategies deployed by students for using the two languages as they worked on the mathematics. and a starting point to develop teaching strategies.